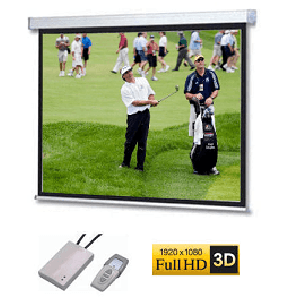 SG Professional Electric Screen A Series 150" - Standard (Video) 4:3 format. The A series are our most advanced and durable screens. The A series range features a commercial gauge screen surface. This thicker vinyl surface is also heavier and as such provides a flatter viewing surface. The extra thickness of the screen surface makes the A series the appropriate choice where durability and damage resistance is important. This screen is perfect for PC-based presentations and general purpose video use in a larger sized room. Suitable for boardroom, general office or home use with a multi-purpose data projector. This size is approximately floor to ceiling in a room with standard 2.4m (8ft) high ceilings. This is our largest L Series screen. Screen surface (viewable area including 5cm border) area is 300cms by 225cms. The housing is slimline white and measures 9cms by 9cms. Overall width of screen including housing with motor is 315cms. This modern screen connects to a normal power point. The screen includes an up/down/stop control built into the power cord and also a RF wireless remote control. The power point should be located on the left hand side of the screen when facing the screen.In many offices the power point may already exist aboive the ceiling tiles.